Given the trendiness of Throwback Thursday, I’m re-branding my beloved series of guest author posts called “Self-Deprecating Sunday.” Self-Deprecating Sunday started because I’d written a YA novel about a girl in R.O.T.C. in high school. I was looking for photos of myself in my uniform–had to get the description of the uniform just right. I found some of those photos. I’m the one in the ridiculous glasses, on the right. Even beyond R.O.T.C., it really cracked me up to look back on all the outfits I wore and what I knew was hip and cool, so I started showcasing some of that on my blog. So much of being a teen is about exploring your identity; it’s partly why I love writing about teens. 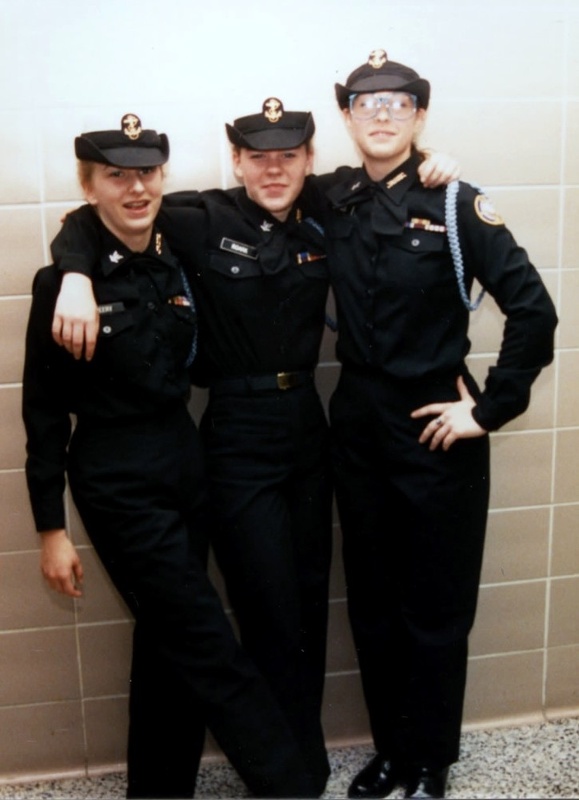 We all get through the awkward years–some of us with more flair than others, and it is fun to look back. Young adult authors around the Internet joined in with me to celebrate their youthful escapes. Today, I’m thrilled to have my friend and Critique Partner (Capitalized because she’d just that good), and debut author, Shannon Lee Alexander, join me for our first installment of Throwback Thursday! Her wonderful novel, Love and Other Unknown Variables hit shelves Tuesday and is getting some beautiful reviews. My family moved to a small southern town when I was in fifth grade. I immediately met two amazing friends, my Em, to whom Love and Other Unknown Variables is dedicated, and Avery, who was the kind of friend you could just be with. Also, her mom had a shiny tiara and a scepter encased in a glass table in their living room, which I always thought was pretty cool. My parents were Yankees. They’re totally southerners now, but back then, we were all somewhat confused by southern customs. For example, barbecue did not mean cooking out on the grill. It was some strange, vinegary, shredded pork concoction that southern people would go to war over if someone were to question its honor. And then there was cotillion. Everyone assured my mother that every proper southern young lady should be attending cotillion. And while I was not so good at proper, I was desperate to fit in, so I begged to go. Basically, at cotillion, boys and girls at the awkward age of thirteen are forced to learn ballroom dancing. I was slightly tall, and hated sticking out, so of course, EVERY SINGLE TIME I’d end up paired with the shortest boy in class. It was unpleasant for us both. I think maybe etiquette was taught, too, but by that time in the evening I was too overwhelmed from having to dance with a boy to pay attention. I just wanted the watered down lemonade and cheap cookies that were calling to me from the refreshment table in the corner of the room. Today’s picture is of Avery and me dressed for the first cotillion. My dad was pretending to be grumpy about us going off to dance with boys. We’re laughing, but inside I wanted to cry. Growing up is a strange Tango of wanting to be grown and wanting to stay small. As a fun aside, Avery and I fell out of touch during college, but recently rediscovered our friendship. Our shared love of reading brought us back together. Her blog, Flutters and Flails, is even featured on the back cover of Love and Other Unknown Variables, which was a fun surprise to us both! Thank you, Shannon, for joining me. I’m so happy you’ve stopped by the blog. Readers, check out Love and Other Unknown Variables, a beautiful story of love, hope and ache of growing up. And, if you’re a YA writer and wish to be featured on Throwback Thursday (formerly Self-Deprecating Sunday), please contact me at jody(dot)mugele(at)gmail(dot)com, or leave a comment. Shannon Lee Alexander, friend, critique partner, and 2014 debut novelist whose book, Love and Other Unknown Variables, is releasing from Entangled Teen on October 7, challenged me to share my Author Bucket List. You can see Shannon’s list here on her blog. And you can pre-order her book, here. It’s a wonderful book I can’t recommend highly enough if you’re into YA books with heart, humor, and hope. See how perfect the cover is? I love it. And here’s the blurb (I pulled from Amazon): Charlie Hanson has a clear vision of his future. A senior at Brighton School of Mathematics and Science, he knows he’ll graduate, go to MIT, and inevitably discover solutions to the universe’s greatest unanswered questions. He’s that smart. But Charlie’s future blurs the moment he reaches out to touch the tattoo on a beautiful girl’s neck. The future has never seemed very kind to Charlotte Finch, so she’s counting on the present. She’s not impressed by the strange boy at the donut shop—until she learns he’s a student at Brighton where her sister has just taken a job as the English teacher. With her encouragement, Charlie orchestrates the most effective prank campaign in Brighton history. But, in doing so, he puts his own future in jeopardy. By the time he learns she’s ill—and that the pranks were a way to distract Ms. Finch from Charlotte’s illness—Charlotte’s gravitational pull is too great to overcome. Soon he must choose between the familiar formulas he’s always relied on or the girl he’s falling for (at far more than 32 feet per second squared). 1. Publish a novel. No-brainer. 2. See a stranger reading one of my books in real life, like on a plane or a beach or the dentist’s office. 3. Write a screenplay. Maybe. The first long work I ever wrote was a stage play. It was utterly awful, but man, it was fun. It would be so much to learn to write a stage play or a screenplay well. But first I need to write a few more novels. I’m a slow learner. 4. See one of my novels become a movie. B) Adapt one myself, maybe? 5. See a YA book by Jody Sparks shelved next to a YA book by Jerry Spinelli, preferably Stargirl. It’s my favorite. 6. Speak at a conference–about writing. Big or small, whatever. The hardest thing will be trying not to accidentally curse. I love it so much. 7. Publish picture books. Funny ones. Toddler humor is the best. 8. See my kid(s) get published. If they want that. 9. Write a series or a sequel. I generally prefer reading and writing stand-alone books, but ya know, why not? 10. Collect enough author-signed YA books that my library is envied. This is ridiculous and embarrassing. But there it is. I should probably have loftier list items and it should probably include more things about meeting and working with other authors. Maybe things will look different once I start actually publishing books. Number 1 still feels like a massive hurdle. Now, who do I challege? Erin McCahan, Tina Ferraro, and Tammara Webber. I loved this book! Noggin was my first John Corey Whaley novel, and I will certainly be reading more after finishing this funny and bittersweet story that is the perfect follow-up to The Fault in our Stars by John Green or Love, and Other Unknown Variables, by Shannon Lee Alexander, or any other book that takes you on a journey of loss and grief and teenage love and leaves you with a longing to make the most of life. 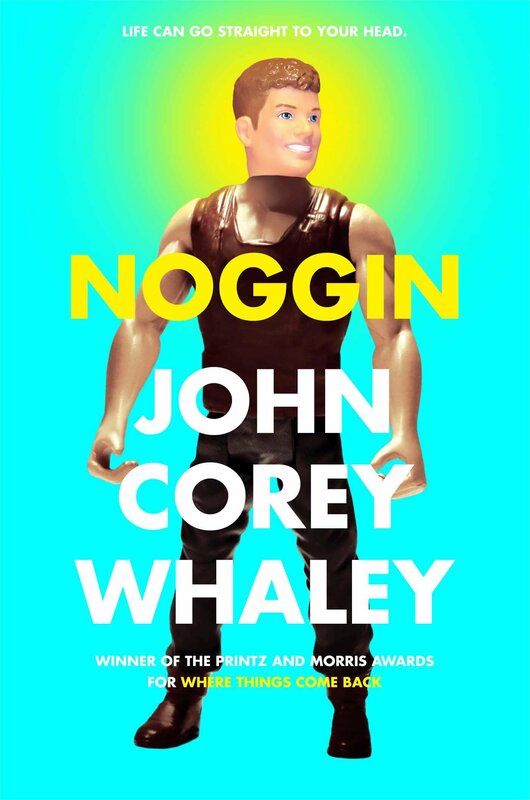 Noggin is a story about a teenage boy who has died of cancer but had his head cryogenically frozen until the day when doctors can attach a new body and give him a second chance at life. That day comes only 5 years after his death–much sooner than anyone could’ve hoped for and just long enough that everyone has grieved him and seemingly moved on, including his girlfriend who is now engaged. His parents are acting strange and his best friend isn’t acting himself either. But for Travis, it’s like he’s just had a nap. Adjusting is hard to say the least. And anyway, Travis knows that he’s been given a second chance for a reason, so he does everything in his power to get his old life back. Good idea, Travis. What could possibly go wrong? I wish I’d thought of this plot. It is such a good metaphor for resisting all that adulthood brings with it–the thing that our beloved characters in The Fault in our Stars and Love and Other Unknown Variables will miss out on. And while we know that our friends in these books would have loved to have had the ache of adulthood, Travis must actually go through it before he’s ready, willing, and able. He does so bravely and stupidly–as you’d expect–and is all the more lovable for it. I’d love to see this be nominated for the Printz this year. I’ve read a few tremendous books so far this year, and this is certainly one of them. So if you’ve just bawled your eyes out after reading The Fault in our Stars or Love and Other Unknown Variables, pick up Noggin.